In August 1972 he moved to Nashville, Tennessee, in search of a musical career and got a job as a songwriter after being discovered by Jerry Reed. He later met and befriended fellow songwriter Guy Clark, who became a major influence on his songwriting and vice versa. While there, he said, "I got a real cold splash in the face of what real songwriting is about. I started filling my mind with as many symbols and images as I could. I started reading. I got real hungry to have something to contribute". Emmylou Harris had recorded one of Crowell's songs, "Bluebird Wine", on her Pieces of the Sky album and made a request to meet him. After he sat in with Emmylou at her gig at the Armadillo World Headquarters in early January 1975, she asked him to play rhythm guitar in her backing band, The Hot Band. He accepted and left the following day to join Emmylou in Los Angeles. His debut album, as well his following two albums, But What Will the Neighbors Think and Rodney Crowell, were not commercially successful despite garnering a huge cult following. Crowell himself criticized his debut album for not translating onto vinyl the same clarity and energy he felt in the studio. His single "Ashes by Now" from "But What Will the Neighbors Think" reached No. 37 on the Billboard Hot 100 in 1980. In 1981, Crowell put his career on hold to produce several of his wife Rosanne Cash's albums. In 1983, Crystal Gayle had a number one country single with his song "'Til I Gain Control Again" from her first Elektra album, True Love. The song was first recorded in 1975 by Emmylou Harris and appeared on Elite Hotel that year. In 1984, Crowell returned to working on his own music career and recorded what was to be a new album for Warner Bros., Street Language. That album, a pop-sounding effort co–produced by David Malloy, was rejected by Warner Bros, and was rejected by the label and never released. Warner Bros. requested a more Nashville-friendly record, but Crowell negotiated a release from his contract and moved to Columbia Records. After producing Rosanne Cash's Rhythm & Romance, Crowell signed to Columbia Records in 1986. His first album for that label was reworked Street Language, co-produced with Booker T. Jones and featuring a blend of soul and country music. The album did not chart. After 1992's Life Is Messy, he left Columbia Records and signed to MCA Records where he released two more albums — Let the Picture Paint Itself and Jewel of the South. Vintage Books published Crowell's memoir, Chinaberry Sidewalks, in 2011. “Chinaberry Sidewalks” focuses primarily on Crowell's relationship with his parents’ marriage and his own early years growing up in Houston, Texas. On February 26, 2013, Crowell and Emmylou Harris released Old Yellow Moon on Harris' longtime label Nonesuch Records. The album reached Number 4 on Billboard's Country albums chart and Number 29 on the Billboard Hot 200 charts. In 2013, the album won the Americana Music Awards' Album of the Year award and Crowell and Harris were named group/duo of the year. On January 26, 2014, Crowell won his second Grammy Award when Old Yellow Moon won the Grammy for Best Americana Album. On 11 May 2015, Crowell and Emmylou Harris released The Traveling Kind on Nonesuch Records. ^ "Music City Walk of Fame Inductees - Nashville Walk of Fame". Visitmusiccity.com. Retrieved 6 November 2018. ^ "All US Top 40 Singles for 1980". Top40Weekly.com. Retrieved 2019-03-30. ^ a b c "The Ballad of Rodney Crowell - Bill DeYoung dot com". Billdeyoung.com. 27 May 2014. Retrieved 6 November 2018. ^ Owens, Thom. "Rodney Crowell — Street Language". Allmusic. Retrieved 2009-09-07. ^ "Rodney Crowell's New Album Coming in September". Cmt.com. 2008-05-29. Retrieved 2017-04-01. ^ Maslin, Janet (January 12, 2011). "Sad and True Love Story, Worthy of Its Soundtrack". The New York Times. Retrieved 2014-04-05. ^ Whitaker, Sterling. "2014 Grammy Awards – Country Winners List". Retrieved 2 February 2014. ^ Luna, Kristen. "Rodney Crowell Helps Bring Hank Williams to Life in "I Saw the Light"". Nash Country Weekly. Cumulus Media, Inc. Retrieved 14 July 2016. ^ Betts, Stephen L. (2017-01-05). "See Rodney Crowell's New Video With John Paul White". Rolling Stone. Retrieved 2017-04-01. ^ "The Ballad of Rodney Crowell - Bill DeYoung dot com". Billdeyoung.com. 27 May 2014. Retrieved 6 November 2018. 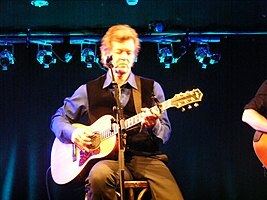 Wikimedia Commons has media related to Rodney Crowell.